Gemma Doyle, a transplanted Englishwoman, has returned to the quaint town of West London on Cape Cod to manage her Great Uncle Arthur's Sherlock Holmes Bookshop and Emporium. The shop—located at 222 Baker Street-specializes in the Holmes canon and pastiche and is also the home of Moriarty the cat. 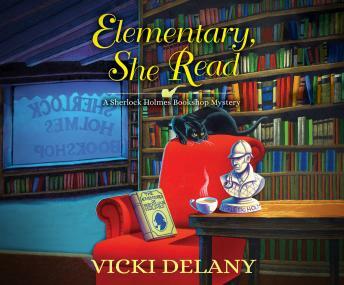 When Gemma finds a rare and potentially valuable magazine containing the first Sherlock Holmes story hidden in the bookshop, she and her friend Jayne (who runs the adjoining Mrs. Hudson's Tea Room) set off to find the owner, only to stumble upon a dead body. The highly perceptive Gemma is the police's first suspect, so she puts her consummate powers of deduction to work to clear her name, investigating a handsome rare-books expert, the dead woman's suspiciously unmoved son, and a whole family of greedy characters desperate to cash in on their inheritance. But when Gemma and Jayne accidentally place themselves at a second murder scene, it's a race to uncover the truth before the detectives loc k them up for good.